Whether your project is a proposed wetland mitigation bank or a culvert replacement for your driveway, we will help you to achieve the goals of the project while balancing your economic realities with the permitting requirements of the regulatory agencies. Our Professional Wetland Scientists (PWS) are highly skilled in the assessment, regulation and management of wetland systems. They bring vast experience with agency coordination and the rules governing the regulatory process, and are able to guide our clients through permitting and offer creative mitigation options. Identifying wetlands and assessing functional values requires scientists skilled in the identification of hydric soils, hydrophytic vegetation and hydrologic indicators. The outcome of your project depends on an accurate assessment of proposed wetland impacts and potential mitigation requirements. The Quest team brings extensive experience in the application of wetland functional assessments such as the Wetland Assessment Procedure (WAP), Wetland Rapid Assessment Procedure (WRAP), and the Uniform Mitigation Assessment Method (UMAM). Once the wetland evaluation is complete, Quest can efficiently and effectively navigate the appropriate local, state and federal resource agencies for applicable permits. When on-site wetland mitigation is the best option, Quest can provide mitigation and restoration design services. Design parameters can be as simple as removing exotic plant species and replanting with a native wetland plant community, to restoring historic hydrologic conditions that allow for greater water storage and wetland-dependent wildlife habitat. Off-site mitigation alternatives are often recommended to avoid the costs and pitfalls of permittee-responsible mitigation. Quest staff can provide the coordination needed to secure credits from an approved mitigation bank and negotiate details with agency staff and the banker. Quest is also experienced in permit compliance, including mitigation and post-restoration qualitative and quantitative vegetation monitoring, maintenance, and site management. 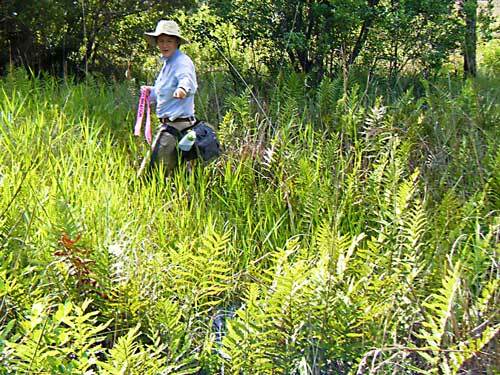 This typically involves field data collection to assess vegetation composition and cover, wildlife utilization, nuisance/exotic species cover, and whether the site is trending toward success. Quest can then implement and oversee any required maintenance or management activities, including but not limited to: herbicide application, erosion control, supplemental planting, or prescribed burning. The Quest Team includes licensed herbicide applicators to conduct the work or provide oversight of the maintenance contractor to ensure permit conditions are followed. An investment up front in assuring that the mitigation is on track and maintenance is performed correctly can ensure that success criteria is met in a timely manner and unexpected additional costly maintenance events are not required. Similarly, implementing short and long-term management activities will ensure protection and continued success of the mitigation area.